Does an individual’s educational achievement at university affect their pay later in life? Looking at evidence on degree classes and UK graduate earnings during the expansion of higher education, we find that it pays to study hard: there is a significant hourly wage premium for a getting a first or upper second class degree. In the UK, as in most other developed countries, the substantial increase in participation in higher education observed during the past three decades, has been accompanied by an increase in inequality in access. Indeed, the rate of participation of those coming from more affluent families grew much more than that of those coming from poorer backgrounds. Coupled with the substantial raise in the returns to higher education, this generated a significant exacerbation of within generation inequality. Since the late 90s’ the UK has been trying to reverse this trend not just through the institution of loans and grants for students from low income families, but also through action aimed at removing some relevant non-financial barriers, namely aspirational ones. The Widening Participation (WP) policy, started in 1998, today receives over 350 million pounds per year of public funds to inspire youths from low socio economic background to go to university. My recent study evaluates the effectiveness of this policy among students who were in high school between 2004 and 2008. My findings show that the WP policy succeeded in raising the aspirations of students eligible for the programme, and also positively impacted their likeliness to stay on at school. But this did not translate into an increase in college enrollment, except for those from the most affluent families. Are we giving bursaries to the right students? One of the main aims of the government’s 2012 reforms to higher education was to create a more marketised system. By increasing the tuition fee cap in England to £9,000 per year, the hope was that universities would compete on cost. The attempt was fruitless; little variation in fees emerged and the average cost of university remains stubbornly close to £9,000. However student financial aid has become marketised over the past decade. This has resulted in huge variation and vast inequalities in the amount of financial support received by students. And with the recent abolition of maintenance grants, these inequalities are set to deepen. The fear that we are over-educating our population is not a new concept. 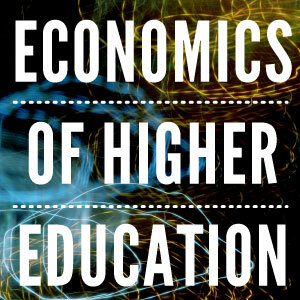 Back in 1963, when only 1 in every 100 people went to university full-time, policymakers were already convinced that any expansion of the sector would result in an over-supply of graduates – many of whom were incapable of benefiting from higher education – and the inevitable falling wage premium (Barr, 2014). Fast forward 50 years, with nearly 40% of young people enrolling in university (BIS, 2014), and here we are, still having the same argument. A report issued today by the CIPD argues that the number of graduates has now “significantly outstripped” the creation of high-skilled jobs, and that over-qualification at “saturation point”. This has led to calls for the government to encourage alternatives to university, and for our young people to think twice about going to university. But do we really have too many graduates? Whilst there are many ways to answer this question, simple economics can help us here. There were a surprising number of announcements relating to higher education in George Osborne’s budget this week. One of the most controversial was the announcement that university maintenance grants for lower-income students in England and Wales are to be scrapped from September 2016 and replaced with loans. The £9,000 annual fees that universities charge students will also be allowed to increase by inflation for those universities “offering high teaching quality”. These moves could harm access to university and are a concern on the grounds of equity and efficiency. While poor students will have slightly more money in their pockets when they get to university, after the chancellor raised the amount of maintenance loan they can borrow, they will graduate with more debt. Grants currently stand at a maximum of £3,387 per year for students with parental incomes of £25,000 or less. This was on top of £4,047 in maintenance loans, so their full package amounted to £7,434. These students will now be able to borrow £8,200 in maintenance loan support if they live outside London, meaning on a cash basis they are £766 better off. However, they will graduate with an additional £4,153 in debt. This means that the poorest students will now graduate with the biggest debts. It is, at first glance, hard to follow the chancellor’s logic here. It is widely known that somewhere around 45p in every £1 the government lends to students will be subsidised by the government, since students themselves don’t repay all of their loans or cover the full cost of borrowing to government. So, extending loans to poor students may not save the exchequer much. And, under the fair assumption that lifetime earnings are correlated with parental household income, the proportion of these loans that will be written off is likely to be higher than average. However, the chancellor may have other intentions here. While increasing student loans will impact debt, they have a smaller impact on the deficit than student grants – which are pure expenditure that will not be paid back. So removing grants will reduce the deficit, something the chancellor is always keen to do – even via what amounts to an accounting trick. The potential impact of these changes on students is an under-researched area. However, there is a small amount of evidence that can help us to understand the likely consequences. Myself and colleagues studied the impact of the previous move to abolish grants, by Tony Blair’s Labour government in 1999. Throughout the 1990s, grants were slowly phased out, then finally abolished in 1999 (alongside the introduction of the first tuition fees), only to be re-introduced in 2004. Our analysis shows that the re-introduction of grants improved participation of students from low-income families by 3.95 percentage points. This strongly suggests that abolishing grants will harm access. Similar studies from the US have drawn the same conclusions. But under the chancellor’s new regime, students will be able to replace the loss in grants with further borrowing. Such a change is, again, an under-researched area, though there is asomewhat relevant 2001 study from the US. In this study, the entire loan portion of the student aid package (which consisted of loans, grants and campus jobs) for low-income students was replaced with grants at one north-eastern university after reforms in 1998. The authors found no significant effect on overall participation as a result of the reforms. However, they did find some effect for minority students, suggesting different groups of students may see grants and loans very differently and may not have the response the chancellor is hoping for. It’s also worth noting this is a study from a single institution with students facing very different financial conditions than those here in the UK. Osborne’s move could have worrying implications for equity and efficiency. While poor students may not face any increase in liquidity constraints – since they will have more cash in hand than previously – they will now graduate with more debt than those from better-off backgrounds. And debt-averse students – who are more likely to be found among the poorest groups – may be put off from applying altogether. As well as being inequitable, this could also be inefficient. The expansion of higher education over the past 30 years has helped productivity, and we need to ensure that talented students from all backgrounds participate. The other major announcement affecting higher education was that some institutions will now be able to increase their tuition fees according to inflation. This will come as a welcome announcement for universities, many of who have been calling for this for years. After all, the 2012 increase in fee caps to £9,000 was meant to give universities more control over their resources, but the government still maintains full control over the amount of fees they can charge through the cap. But the announcement came with strings – only those institutions that do well in the recently proposed Teaching Excellence Framework, which will monitor and rank universities for great teaching, will be allowed to apply inflationary increases to their fees from 2017. While the £9,000 fee cap has been allowed to erode with inflation since 2012, it is worth noting that inflation is rather low at the moment, suggesting that the new policy will not have a huge impact on university finances. More importantly, the government can’t yet afford to allow universities to make large increases to fees. Again, this is because of the high cost to the state of providing loans to students who may not pay them back. Any fee increase would come at a cost to the government. But there are ways round this. The government also intends to: “review the discount rate applied to student loans and other transactions to bring it into line with the government’s long-term cost of borrowing”. The discount rate is a way of accounting for the fact that money paid in the future is less valuable to the government than money paid now; £1 today is worth more than £1 in the future. Student loan repayments come in slowly, over decades, so the government has to decide how much to value – or discount – these future payments. If the government decide to reduce the discount rate, this means valuing future loan repayments more highly; hence future student loan repayments will automatically be worth more to the government than they were previously. So the estimated loan subsidy (and the amount of student loans that will not be repaid, also known as the “RAB charge”) will be reduced without any actual increase in repayments. The government can also make loan repayment terms more punitive for students. Osborne also announced that the government is going to consult on freezing the repayment threshold for how much graduates have to be earning before they start paying back – currently set at £21,000. Such a move could largely balance out the cost of allowing fees to rise with inflation, since, as earnings go up, more graduates would find themselves over the threshold for repayment. This may be the start of a move toward even more punishing loan repayment terms as the government attempts to further reduce taxpayer expenditure on higher education and move towards a market-based, consumer-led sector.